"I think of the book as an archive of human knowledge filtered through branches of thought." Katie Holten is an Irish artist. She represented Ireland at the 50th Venice Biennale. Solo museum exhibitions include New Orleans Museum of Art (2012); Dublin City Gallery The Hugh Lane (2010); The Bronx Museum, New York (2009); Nevada Museum of Art, Reno (2008), and Contemporary Art Museum St. Louis (2007). Committed to social causes, especially as they pertain to environmental issues, Katie is fascinated with the inextricable relationship between man and the natural world in the age of the Anthropocene. She is the artist behind About Trees, the first book in Broken Dimanche Press’s new series Parapoetics: A Literature Beyond the Human. Her artwork can be found at katieholten.com. Asymptote: How would you describe About Trees to someone who hasn’t heard of the project? 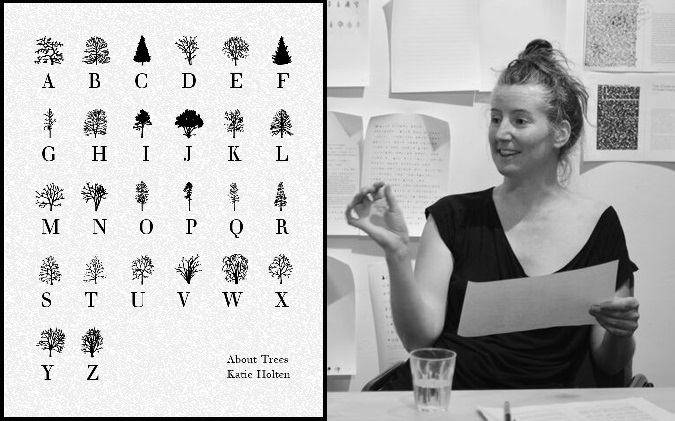 Katie Holten: About Trees is a book about trees written in trees. It’s a collection of texts about trees, about the notion of trees, and a constellation of tangential tree-related things. Everything is translated into Trees, a new typeface that I made especially for the project. At the core of the book is a Tree Alphabet with trees replacing each of the 26 letters of the standard English/Latin alphabet. These characters were transformed into a font, the typeface called Trees. The book is limited to an edition of 500 copies. It’s 260 pages deep, stitched, printed throughout using a forest-green spot-color with a hand-painted, lime-green fore-edge. It started out like a collage, a collection of found and mostly ‘recycled’ texts. Some were commissioned especially for the book and others happened along the way during conversations with people. There’s an essay on “Tree Clocks and Climate Change,” a hunt for “Liberty Trees,” and a conversation asking “Why are There no Trees in Paleolithic Cave Drawings?” Trees are a metaphor, a way to filter the enormous, tangential web of information available to us—a way to focus the discussion. Everything is printed in the typeface Walbaum (which has baum, the German word for tree, in its name) and translated into Trees. Each text becomes its own forest. I think of the book as an archive of human knowledge filtered through branches of thought. It traces a shift in consciousness from anthropocentric thinking to a contemporary realization that our way of life has probably created a new geological epoch, the Anthropocene. The book maps the move from Darwin’s “I think,” written beside his sketch of the tree-of-life illustrating human consciousness as the highest step on the evolutionary tree, to Eduardo Kohn’s “How Forests Think,” an anthropology beyond the human. The writings of Bruno Latour and Timothy Morton have been useful for me to understand my own work and current thinking around object-oriented ontology, which puts things at the center of the study of existence. Page 26 from About Trees, 2015. Tacita Dean’s essay “Michael Hamburger” translated into Trees. I’m fascinated by our understanding—and misunderstanding—of the systems around us. Man-made systems, like cities for example, mirror microscopic bacterial colonies. Yet we humans tend to see them (cities, or indeed most man-made things) as being something completely removed and separate from ‘nature’. These colonies, whether fungal, organic, man-made, microscopic, or intergalactic, all mirror each other with similar growth patterns that repeat at different scales. These clustering, branching patterns shape everything from our lungs and neural pathways to cracks in the mud, lightning, river estuaries, evolutionary paths, language development, algorithms, and the Internet. There’s something about trees that’s universal. The book started out as a small project but grew into something larger, the way things do. Now it feels like an anthology or a compendium. I’ve starting thinking of it as Volume I in a grand—possibly infinite—series of volumes About Trees. How did you come up with the idea of creating a typeface out of trees? The Trees typeface has roots reaching back to 2004 when I moved to New York City. I was researching our understanding of ‘nature’ and our relationship with it in the city. The first drawing I made was on a small piece of paper, just a normal 8.5” x 11.5” page. It was of a collection of New York street trees. The trees were drawn quite small and it looked kind of like a letter. A love letter? I’m not sure. But it looked like a letter scrawled in a strange language. I made more and the trees fell into a grid, mirroring perhaps the Manhattan street grid. They were my notes telling the story of my time in NYC—the grid walked that day and the street trees passed along the way. I’ve worked on lots of other projects since, but over the years people kept contacting me about those tree drawings. I see strangers share them online and they have 200,000+ likes on sites like Pinterest and Tumblr. I don’t know exactly what that means, but the tree drawings have a life of their own. It feels like they exist out there in the ether. They communicate: people respond to them. I’ve always liked the idea of giving things away. So, over the last ten years I’ve often thought: wouldn’t it be nice to make the tree drawings into something that people can access and use themselves. They should be available as prints, tattoos, a font, a typeface. Something ‘tangible’ that people can hold, wear, use, rather than a JPEG or screenshot that’s only available to ‘like’ on a screen. I thought, the tree drawings should actually exist in real life. I can use the trees to communicate and tell a story and people might pay attention because so many seem besotted with them. A few things came together this winter which led me to revisit the drawings and create the Trees font: I was invited to make new tree drawings for a group exhibition (called About Trees) at the Zentrum Paul Klee in Bern, Switzerland; I’d been wondering if there was a way to make my older tree drawings more accessible to people; I kept thinking about the notion of writing with trees, or using trees to write; and I’d been talking with Broken Dimanche Press about developing a book project. I realized that all these different things—book, drawings, trees, typeface—could come together into one project: About Trees. It was nice to see it crystallize so quickly. How do trees connect with language? For me there’s a direct connection between trees and language. In Ireland we have what’s known as Ogham. It’s a medieval alphabet scratched onto standing stones. No one knows for sure how it worked, or what it signified. But growing up I was told that it was some kind of tree alphabet: the marks, or scratches, represented different trees. For example, Beith = “birch” and Dair = “oak.” Somehow these scratched markings relayed messages to people. Ogham Alphabet: fol. 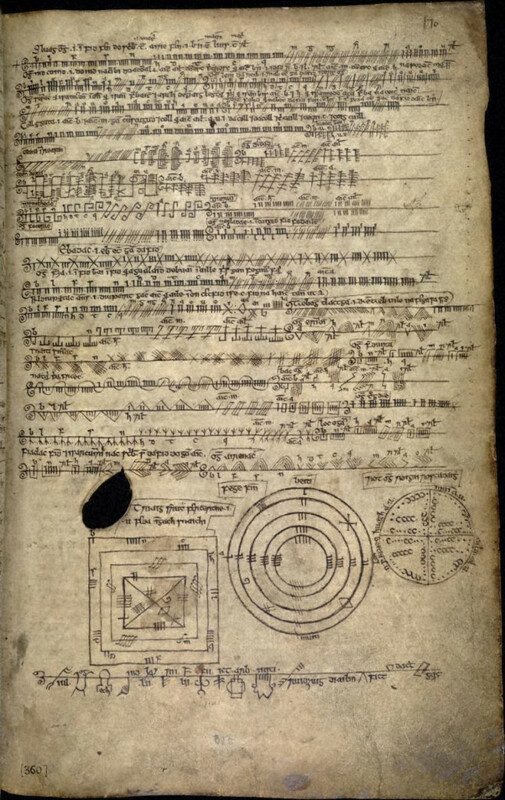 170r of the Book of Ballymote (1390), the Auraicept na n-Éces explaining the Ogham script. I’ve always been fascinated by language, by systems of knowledge, by archives. I wanted this book About Trees to look at all of that through my own personal, man-made language. The texts look at the world around us, at the ways we’re embedded in—and have affected—the world around us. Elizabeth Kolbert writes about “Islands on Dry Land” and how our species has cut into, and cut through, every wild place. Creating unnatural lines in the landscape—slashing through rainforests, installing pipelines—we are literally changing the shape of the world. Things in the organic world have a way to communicate that seems to work beyond our notion of language. There’s a reason things are the way they are. There’s a reason trees are structured the way they are. Brian Enquist talks about that in his essay “Tree Theory, Biogeography and Branching.” You could say that this natural language is a code that’s been developed over millions of years. It’s beyond us. We’re not sensitive enough to ‘get it.’ To us it’s just indecipherable, messy, nature. Like a newspaper in a foreign language, it’s gobbledygook. From a distance it looks ‘normal’ and readable, but when you get a little closer you see that it’s impenetrable, purely visual. It’s essentially written in code and you don’t have the key. For a long time I’ve felt that our language is broken. We don’t know what things mean anymore. At least I don’t. What is ‘nature’ exactly? What is ‘environment’? Or ‘landscape’? Or ‘green’? Robert Macfarlane writes in the book about “Branches, Leaves, Roots and Trunks,” about lost words, words that have disappeared from our vocabularies and dictionaries. I wanted to see what would happen if I made my own alphabet, my own typeface, and translated the word/world. Can you explain the “mechanics” of your typeface—does one tree represent a letter, or does it represent a word/idea? It couldn’t be simpler. I drew a tree for each of the 26 letters of the alphabet. It’s like a children’s ABC. A is represented by a tree whose name begins with the letter ‘A,’ B is represented by a tree whose name beings with the letter ‘B,’ etc. The Tree Alphabet drawing/print/bookmark is the key to unlocking the code. When I was in Berlin working with the designers and exploring how we were going to use the Trees typeface, we made a set of bookmarks. They were a way for us to test the font while also making something useful (I used the bookmarks as postcards and thank you cards for people who pre-ordered the book). One of the bookmarks depicts the Tree Alphabet and with it you can attempt to translate the book. The mechanics of creating the typeface was more complicated. I’m technologically challenged, so I needed help. A friend connected me with one of her students, Katie Brown, and luckily for me she was already working on hand-written fonts and was excited to plunge right in. I scanned all my tree drawings and she turned each one into a vector file and then worked on them individually and inserted them into Glyphs, a font-making program. I got the file with the finished typeface—the Trees font—the day I left for Berlin to meet the designers. None of us knew if it was going to work. But it did! The biggest problem was how to use the font. How exactly should we translate the original texts into Trees? The ‘letters’ in the tree font take up more than four times as much space as letters in a normal font, so 100 pages of English text would translate into over 400 pages of Trees. That could be really interesting, or incredibly boring. Never mind the waste of paper and trees! I spent a lot of time working out different ways to translate each text. I finally decided that each text should be translated into a forest. With short texts it’s possible to see/read each individual tree/letter in the Trees translation, but with the longer texts the trees crowd together forming dense forests of encoded meaning. It becomes literally impossible to translate them. That’s what I’m interested in: the impossibility, the futility of it all. The conventional process by which human, symbolic language runs from thing to idea via word is reversed by translating each text into a cryptic tree-forest. Language is turned back upon itself by (re)turning letters to a pictographic field. The texts in About Trees range from lyrics by Radiohead to literature by Plato and Ursula K. Le Guin. How did you select the texts for this project? There are very specific reasons why each text is included. And there are so many more texts that I’d like to include but couldn’t, for all the usual reasons; lack of time, money, space. It really does feel like Volume I of a potentially infinite series. My initial proposal was for a book with texts by three women. But pretty quickly I realized that I wanted to have a wider selection, mirroring how we’re bombarded by information all day, every day. So there are contributions ranging from super-short (a one-word poem), to short (an Instagram post, the title of a novel, Le Guin’s “The Word for World is Forest”), to one-page meditations and longer essays. There are a few key texts for me: things that I had to include in the book in order to anchor it. These include Nicole Davi’s essay on “Tree Clocks and Climate Change,” Aengus Wood’s essay on the Ogham alphabet and my conversation with Conny Olsson from Arctic Paper Munkedal, the paper mill where the paper for the book is sourced. Another important text appears three times in the book; at the beginning, middle and end. It’s a sentence from Jorge Luis Borges’s short story “Funes el memorioso.” Each iteration is a different translation, so each time you read the sentence it’s the same, but not. Ida Bencke’s text was the very last thing to be added, literally as the book was going to print. The last thing we worked on was the cover and suddenly we needed an image for the dust jacket. I wanted to include a forest, but I didn’t want to repeat a text/forest that was already in the book. Ida had written a short text “About About Trees” to contextualize my book within the Parapoetics project that she’s curating for BDP. My book doesn’t include an introduction or a foreword or anything at all to explain it. I prefer to let things be themselves and exist on their own terms, without me putting words/thoughts in the reader’s head. But I thought that Ida’s text, translated into Trees on the cover, could work as the introduction. 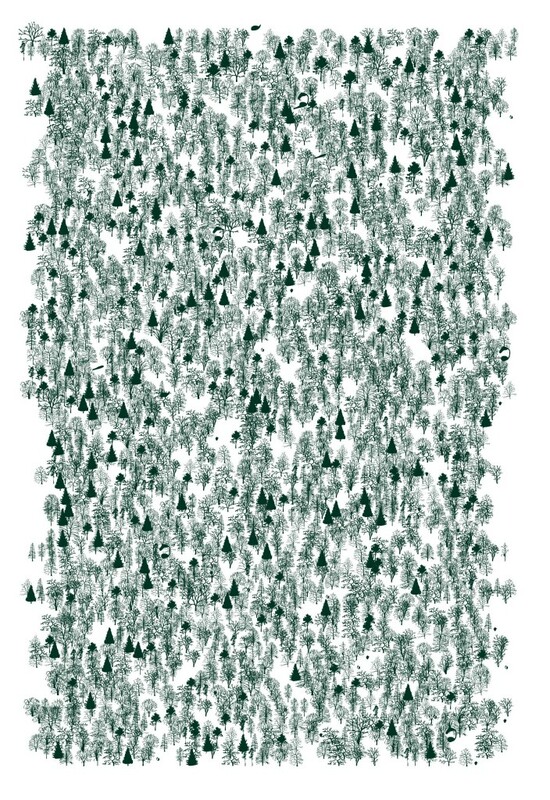 It’s a forest, indecipherable as a text. No one can actually read it. It mightn’t even look like writing. You can’t see the wood/word for the trees. We placed the English translation (i.e. : the original text that Ida wrote), on the inside flaps, typeset in Walbaum like the rest of the book. So, anyone who opens and engages with the book can read her text and understand that the forest on the cover is actually a text, translated into trees. What experience are you hoping readers will gain from rediscovering these texts with your new typeface? I hope the book provides an opportunity to (re)discover these writings. I also hope readers can consider their relationship with language, landscape, and perception. For me, the Trees typeface is a way to examine my own relationship with information, knowledge, time, memory, and my place as a human on this planet in the Anthropocene. I would like the book to affect, even just a little bit, how people read the world. I feel that as a species we’ve convinced ourselves that our version of reality is right, that what we do is right. I fear it’s not. We’ve used language to twist the meaning of things. The contributors provide a wealth of knowledge and material. I’m like a gleaner, but instead of picking blackberries from a hedgerow or collecting empty bottles from trashcans, I’m gathering words. So much valuable material exists out there in the world, but gets overlooked and forgotten in the data overload. I wanted to include something by James Gleick, as his writing about science and knowledge was so important to me growing up. I ended up including an article he wrote on Benoît Mandelbrot. I hope some readers, if they haven’t already, will take the time to read his book The Information: A History, A Theory, A Flood, a book about everything. I hope that my book About Trees is the tip of an iceberg that leads readers on a journey through all these amazing, existing works. “The past is a foreign country,” one of the contributors wrote to me in an email. I think the present is also a foreign country, and we have yet to learn the language. By bringing together a disparate group of texts, I wanted to try and understand our present. Translating everything into a new, indecipherable language makes it obvious how little we know. About Trees will be launched by Broken Dimanche Press at the New York Art Book Fair at MoMA PS1 September 18-20, 2015.
i love this idea, Alistair. Fantastic analysis . I was enlightened by the insight – Does someone know where my business might be able to find a template a form version to fill out ?